To round out AiP's discussion on our relationship with fashion, today we're looking at the counterfeit industry. On Monday, we probed the appeal of high-heels. And on Wednesday, we discussed a particular color trend in New York City. As always, comments are welcome. 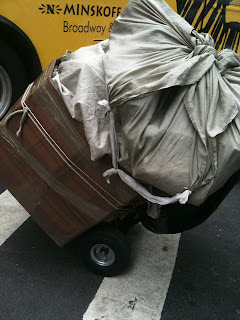 The battered cardboard box balanced precariously on his small handcart as Asad (1) hurried across the street. The box seemed innocuous enough, but he had lined it with comforters to protect the cargo within and wrapped the exterior with twine to curtail prying eyes. Still to those who know, Asad’s package is a highly recognizable symbol of illicit trade in wealth: the container for fake, high quality designer handbags. Asad was hurrying to his downtown location, where he would meet with other “sidewalk” retailers waiting to show their goods to people who ask. If caught by the police, he would likely have his goods confiscated, and be ticketed. Depending on the number of prior offenses, he could spend a night in jail. Sure there was reason for him to be cautious, but who said selling respectability would be easy? The sale of counterfeit goods runs the gamut from pirated DVDs and CDs to clothing and accessories, like handbags and sunglasses. New York City’s Chinatown has long been a center for trade of this sort, but crackdowns in recent years has moved the business away from the public eye to padlocked rooms in seemingly abandoned buildings. Obtaining knockoff designer items in Chinatown is an experience: customers are solicited on the street and follow the hawker, usually an older Asian woman, away from the bustling thoroughfare of Canal Street to one of the nearby quieter streets, through a locked door, up a dismal staircase, to a padlocked door where the customer is ushered in and then locked in. It is not an experience for those who are wary of New York City in the first place. For those seeking a less intense counterfeit shopping experience, it may be better to hope to encounter Asad and his colleagues—though you have to know what you’re looking for, and need to project the air of a tourist if you hope to get them to show you their goods. Houses in these communities are often set far apart with privacy of all ensured by long driveways, high hedges, and sprawling lawns. Neighbors are unlikely to casually bump into each other as they come and go in their communities, and children are unlikely to play on street corners. Paradoxically, once again, it is possible that the wealthiest neighborhoods are among the most vulnerable to low levels of cohesiveness and efficacy (4). And yet Americans look to accumulate the trappings of wealth: larger houses, multiple cars, and certainly designer items. The counterfeit trade provides access to the illusion of wealth, but what drives this need to display branded items? One potential means of thinking about this may be through the lens of reputation and respectability. Anthropologist Peter Wilson proposed the dual concept of reputation and respectability to help explain how ideas of self are formed and maintained in colonial settings. In terms of class and economics, Wilson argued that for those with the means, respectability could be purchased and one’s reputation did not matter. However, for people without purchasing power, reputation was crafted by achievements and respectability did not matter. Wilson traces these patterns in the Caribbean, as former colonial subjects adopt models for respectability via purchasing power and drift away from reputation-building, moving from a qualitatively-oriented society that emphasizes achievements to a quantitatively-oriented society that emphasizes accumulation of goods and wealth. This sort of dichotomy may be applicable outside of the colonial frame where there are class divisions around large status items. Purchasing a fake handbag or fake sunglasses allows an individual to appear to compete with others within their social circle and/or members of society at large who may be sporting these items. Inequalities of wealth, power, and influence have existed for a long time. We can find examples of these sorts of social discrepancies in the distribution of pastoral wealth: who has more livestock, by what means are these numbers maintained, how are resources shared (5)? The ways in which individuals seek to address these discrepancies, and whether they do, is revealing about the state of their social order. Addressing this issue has become a profitable one in the United States: Asad and his contemporaries may be viewed as entrepreneurs in the sale of respectability. Have you or has someone you know ventured into the underbelly of Chinatown’s trade in fake designer handbags? Or have you encountered salesmen like Asad? Share your stories below. 2. Luthar, Suniya (2003). The Culture of Affluence: Psychological Costs of Material Wealth: 1584. 5. Waller, Richard (2010). The Emergence and Persistence of Inequality in Premodern Societies: 117. I'm intrigued by one statement: "People who accumulate wealth often have a specific talent that they are capitalizing on, and become single-mindedly focused on developing and maintaining this talent, often to the detriment of personal relationships around them." That does seem to match rather well. I recently turned down a contract which would have given me an extra $10,000 per year, on work that I could handle at my own pace outside of normal work hours. A large part of why I turned it down was that it would cut into my increasingly limited personal time. Regarding the Chinatown warehouses, I've never encountered them - in fact, when I'm touristing in NYC, I'm pretty firm about turning down street vendors. And I *wouldn't* go into a locked warehouse like that. but this reminds me of the Green Hills Bazaar in Manila. One couldn't walk five paces without being accosted by an individual offering to sell pirated DVDs; the scheme was that you'd say what you wanted, the seller would take your money then go to his storage and return with the DVD. I've no idea how many sellers there were for a given setup; I imagine quite a few. but rumor also had it that many of the supposed sellers were undercover police. I, having access to a good broadband connection, didn't patronize them. That was something that gave me pause as well, Hasufin. Developing talents and skills carries a high social cost in some cases. For a long time, the norm however, was to establish oneself in a position to reap the benefits of a talent or skill. Heck, it's still a large part of the "American Dream." However, like you, increasingly people are weighing the costs which may eventually bring about a change to work culture. My earliest work in anthropology investigated qualitative versus quantitative markers of status. Capitalism tends to encourage quantitative markers ... perhaps compounded by the recent economic difficulties that so many find themselves facing, the scales may shift slightly.